Happy 58th Anniversary to ZAOGA FIF!! We trust everyone had jubilant celebrations thanking God for 58 years of grace. Indeed we serve a great God. We thank God for the millions of lives that have been touched through this gospel. We thank God for raising a man Prof Ezekiel H. Guti who continues to be faithful to the calling God placed on his life together with Dr. Eunor Guti. Apostle Dr. Eunor Guti officiated the Official Opening of our church, Norton City District. The message she brought was: " The purpose of the church is to bring many souls to the Lord. The man of God's main objective is for many people to receive Jesus Christ as their personal Savior. Keep whatever you get in this church. If you listen and carefully observe what our father teaches, you will be successful." One lady had a shortage of blood and she was instantly healed. Another lady was healed from bleeding. 4 people were healed from Cancer. People were also receiving prophecies. 8 people were prayed for marriage restoration after prophecy. To God be the glory as we the nation of St. Kitts congratulate our father for turning 95 years of God's grace and seventy years of preaching the gospel of the kingdom of God non stop. During the week, the pastors were called when the daughter of one of our believers was attacked by evil spirits at school and was taken to hospital. The God of our father Ezekiel delivered her in a mighty way such that the nurses wanted to know which church the Pastors came from. We thank God we celebrated the 58th Anniversary in style dressed in FIF T-shirts and regalia. The service was full of joy and being emotional as the believers were bidding farewell to pastors Fanuel and Debra Phiri as they are going back to Zimbabwe after doing a wonderful job while they were here. The celebrations are continuing at Forward In Faith Ministry Nevis as we have so much to thank God for. Our Big Sunday was great and while we had to say "So Long" to Pastors Enock and Vee Tigere. Sunday’s worship was an explosion of the Holy Spirit in our midst as a total of 31 persons (24 Adults, 7 Children) worshipped with mighty shouts of Hallelujah thanking God for bringing FIFMI through 58 years under the leadership of our father and mother, Dr. Ezekiel Guti and Dr. Eunor Guti. Our worship ended with Celebrations of the 58th anniversary of FIFMI and readers took turns highlighting the history of the church. A special cake was mounted and our members enjoyed fellowship along with the Mothers who were honored for Mothers’ Day. We thank God for what he has been doing in Nevis and pray for the strength and determination to get to the next level in God. The Forward in Faith Ministries Oman Church also joined the ZAOGA FIF world wide family to celebrate the 58th Anniversary of our church with a maximum total attendance of 54 people attending the celebrations. Elder Farirai and Dorothy Chigwanda from Dubai were the speakers and were mightily used by God. The praise and worship was so powerful and there was a tangible presence of the Lord as the worship team sang old time songs. The history of the church was read and it became alive with clips that showcased our father Apostle Guti back then from using a bicycle to motor bike and in his own words narrating how God called him. The video clips were shown on a screen via a projector. Long live the Apostle of God, Professor Ezekiel H. Guti and long live ZAOGA FIF. Our church also celebrated the birth of our father who turned 95 and ZAOGA FIF for turning 58. We held a service on Friday night. On Saturday, we spent the whole day at church having different activities, which included reading of the History of ZAOGA FIF, testimonies and preaching. Sunday had the highest attendance of 48 persons including two visitors. Different people gave testimonies of thanking Baba Guti for bringing this true seed to Jamaica. People’s lives are no longer the same. Two of our sisters who attended the Deeper Life Conference in Zimbabwe gave electrifying testimonies of the ZAOGA FIF historical sacred places they visited. They made the reading of the History Book very lively as they testified. There was great joy and jubilation as people celebrated the church's anniversary. A brother who came to church using a crutch was instantly healed after being prayed for and went back home free. Glory to the God of our father. We administered Holy Communion led by our church Chairman. After church we held a powerful fellowship where food was served to every person. We continue to appreciate your prayers for Jamaica. Happy 95th birthday to our Father Apostle E.H. Guti. 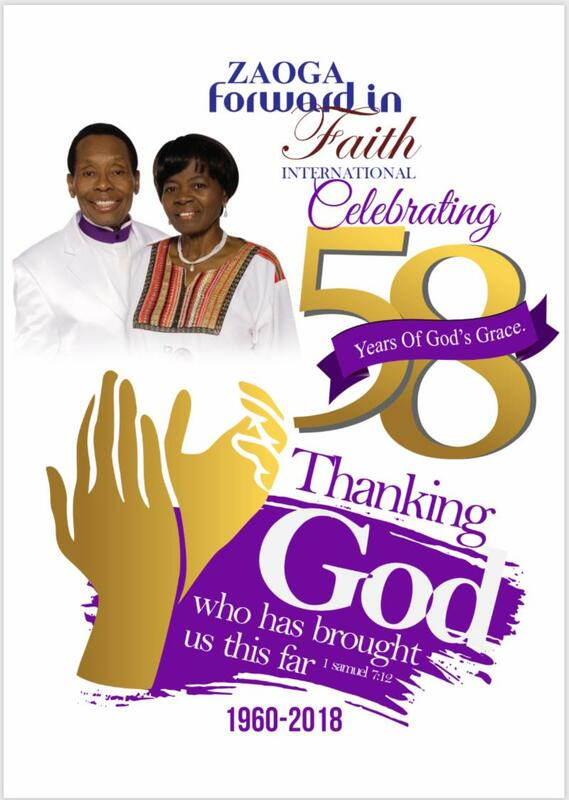 We would like to congratulate Forward In Faith for 58 years of reaching many nations and impacting lives by the Kingdom of God. Glory to God! Church history was shared and followed by a sweet fellowship including the cutting of the celebration cake. We thank God for a brother who was baptized last Saturday. There is so much joy, zeal and hunger for the word, since the day he gave his life to Jesus Christ. Glory to God! As the new week began Miami F.I.F. was graced by the presence of missionaries Evangelists Enoch and Virginia Tigere who were enroute to U.K from Nevis. The word was shared powerfully leading to deliverance from religious spirit and spirit of infirmity. Glory to God! Thank you for the ongoing prayers for a great revival in the nation of U.S.A. and the advancement of God's kingdom. Fort Dauphin joined the FIFMI family worldwide in celebrating the 58th. We went preaching with instruments in a car as marched for 2 hours advertising our anniversary. 2 men gave their lives and they came to church with other new people. The police assistant commissioner visited our church and promised to keep coming with his family. The presence of God was evident leading to many people being delivered. A lady’s nephew was healed while another lady was healed from asthma and gave birth without complications. Our attendance was 72 adults and 42 children. Everyone enjoyed eating the anniversary cake. Praise the Lord for such a successful anniversary. a woman who asked for prayer for her son testified a miracle job, despite his young age. a man gave his life to Jesus. We thank the God of our father Ezekiel Guti for his love and grace towards the nation of Malawi. We had a powerful Elders and Deacons National Deeper life conference from 25-29 April 2018 in Blantyre with an attendance of more than 250 delegates for the first time in history. 80 people rededicated their lives to Jesus Christ. The conference was successfully hosted and there was a good team spirit and oneness. We had powerful guest speakers from Zimbabwe, District Pastors Steve and Lizzie Chibhagidi, Elder Violet Aleck Manda and other local speakers. They were mightily used by God. 20 people were delivered from evil spirits. 15 people were baptized in the Holy Spirit. 24 people were healed from different ailments. The preachers mainly hammered much on the area of church pattern and giving and people were helped a lot. On Sunday we saw the practicality of what had been taught at the conference. We used to struggle when we wanted to raise the items for the conferences but this year for the first time in history all the items for next year Deeper life are already done. It has never happened in Malawi before. Glory be to Jesus Christ. On Saturday 28 April we saw the hand of the God of Ezekiel when one of the popular Television broadcasters in Malawi Mibawa offered to come and shoot our service for free for the purpose of advertising our church in Malawi. Thank you for praying for our church in Malawi. Malawi for Jesus!!!! Thanking God for the Servant and Apostles of God, Prof Ezekiel H. & Dr. Eunor Guti for giving them supernatural strength. Thanking God for giving them wisdom and revelation as the work continues to grow. Thanking God that we can find a good private property for the Lighthouse of Mercy. Thanking God that all the church leaders do their part according to the vision given to the servant and apostle of God. Thanking God for opening doors and providing the required visas to the new nations that Baba & Amai need to go to this year. Thanking God for the National council to be held Tuesday May 15, 2018 at AMFCC, Harare Zimbabwe. Thanking God for the Mozambique Deeper Life conferences to be held throughout Mozambique from May 16-19, 2018. Thanking God for journey mercies for people traveling from other nations and around Mozambique and for speakers to flow in the same spirit of the church and the vision of the Apostles of Jesus Christ. Thanking God for visas for long term missionaries and those that need to be renewed. Thanking God for Overseer Eliah Muzanamombe to be completely healed. Thanking God for giving UAE and Argentina a good meeting place and mission house for Argentina. Thanking God for providing the van Malaysia needs to carry believers. Thanking God for your nation. 1 John 4:1 "Beloved, do not believe every spirit, but test the spirits, whether they are of God; because many false prophets have gone out into the world." A warning: there's a spirit entering the church to deceive the people. Be careful. The spirit comes to the people and you can prophesy good things and you think it's from God. You can prophesy and deceive yourself. You believe in vain and you follow what you think God is saying to you, yet it's just empty words. Don't prophesy yourself in vain. You will be pulled out by another sprit, a spirit of pride, thinking that you are somebody yet you are not. That's a spirit. Be careful of a deceiving spirit. Deceiving spirits cause you listen to what you want and not what God is saying. God doesn't always speak to us all the time, God uses circumstances to make you think. God bless you. ZAOGA Forward In Faith Ministries Int.